Welcome back to the blog! Today I’ve got another review for you in partnership with Gunfire.com and we’ll be looking at the SA-H08 carbine replica from Specna Arms! If you’re an avid reader of the blog, you’ll know I’ve reviewed a few guns from the Specna Arms range of AEGs but what’s different about this model is that it is one of their ‘heavy’ models meaning it’s made mostly from a zinc/aluminium alloy and reinforced with steel parts which includes all the screws, pins and sling swivels! In fact, the only polymer parts you’ll find on this AEG are the stock and the pistol grip. Let’s talk about aesthetics! 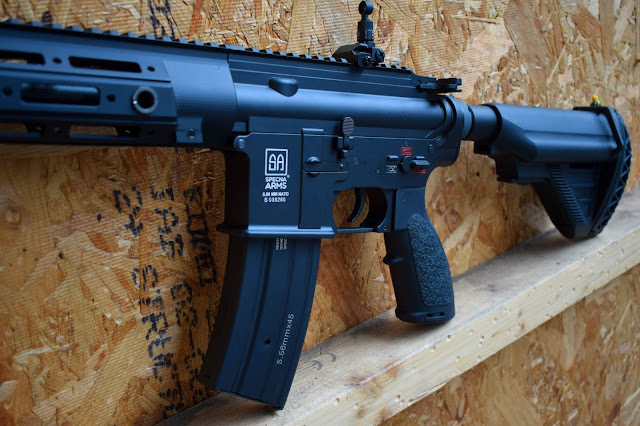 The SA-H08 is styled similar to the HK416 which gives this budget rifle a high-end look, particularly the stock! 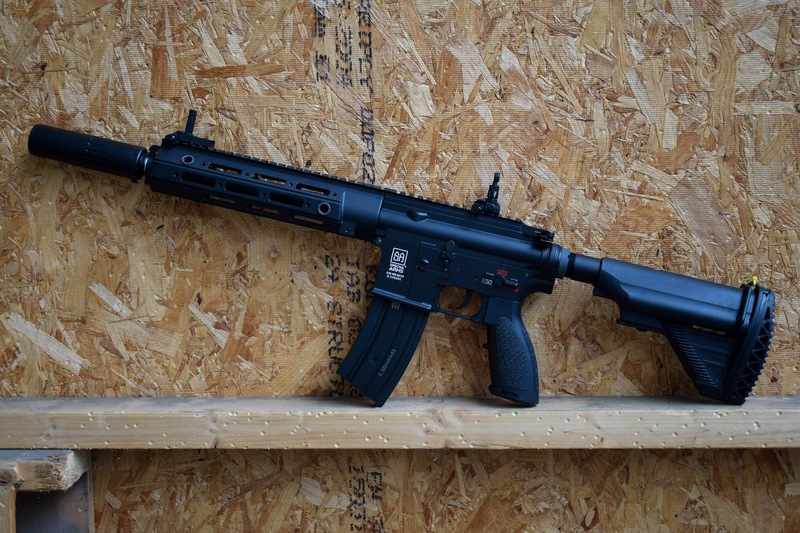 It has an anodised receiver with manufacturers markings and an anodised RIS MLOK hand-guard. The paint on the replica was applied via powder coating which provides a higher resistance to abrasion, scuffs and chips when compared to other paint finishes. 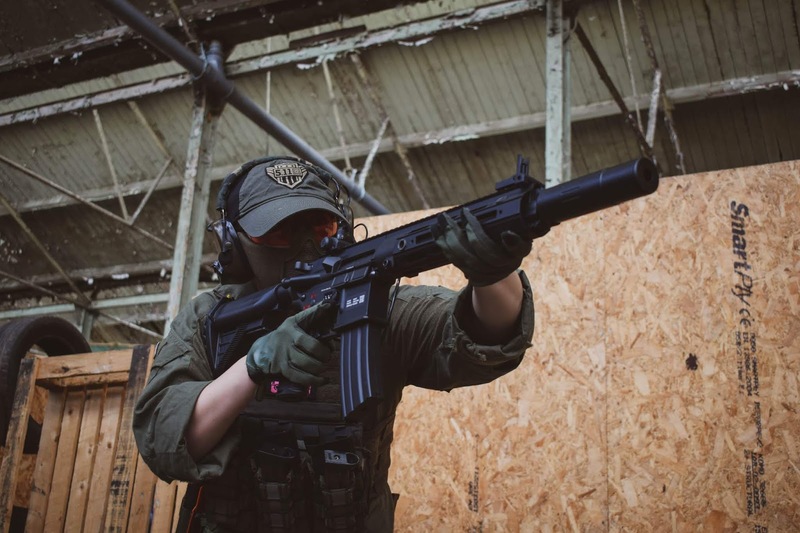 It has a top RIS 22 mm rail, RIS hand-guard featuring an MLOK attachment system and an adjustable stock which stores the battery. 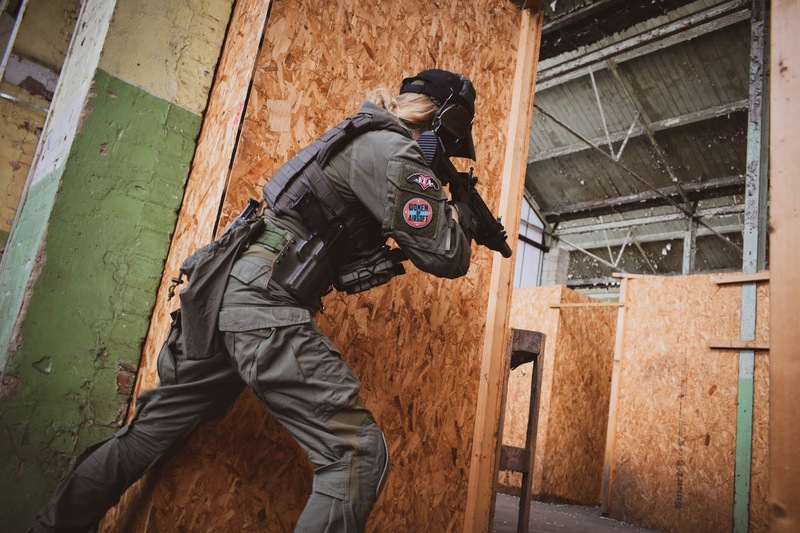 The top RIS rail has metal flip-up iron sights, which are detachable. The replica is finished with a QD silencer mounted on a 14 CCW thread - which I REALLY Like! What about the internals? Well, it has a ‘reinforced at cylinder level’ gearbox that contains a steel spring slide which is an element of the Enter & Convert quick change spring system. There are four anti-reversal latches. The lightweight, polycarbonate polymer piston is equipped with a steel tooth in order to increase durability. Also, a type 2 cylinder and a steel circuit-breaker, as well as a metal Hop-Up chamber. The replica is fully compatible with LiPo and LiFe batteries. 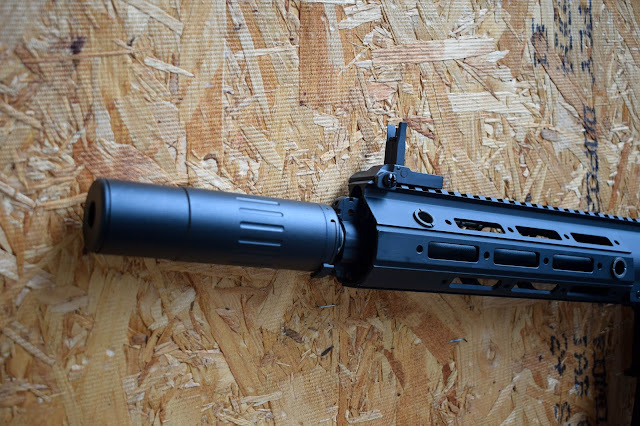 I asked Gunfire to downgrade my SA-H08 from its base muzzle velocity of 430 FPS to comply with UK site limits, they replaced it’s manufacturers spring with an M90 spring (which is included in the box) to bring the RIF to an FPS of sub 330. Like its sister replicas, it features a quick spring release system, called Enter & Convert™ which means you can change the spring quickly without special tools or access to a workshop. I took the SA-H08 for a day of CQB at one of my favourite haunts for its first run - the battery was easy to install and it passed chrono at 318 FPS (well within the legal limits). Thanks to the rotary style hop-up the hop was easy to change and the range was pretty good out of the box. I ran the rifle barebones, so no optics, lasers or torches - just the iron sights that are included in the box and I was happy with how it ran, although I did sack off the mag that was included for my trusty EPM X MAGPODS. There were no feeding issues or jams. The sound from the internals isn’t the best but it's not the worst. As the replica is made out of mostly metal parts, it is pretty heavy and did give my arms a slight ache - DON’T SKIP ARM DAY! Overall, I was pretty happy with the performance, but is there anything about the SA-H08 that I don’t like? Yes, as with most products there’s always something that could be improved. The steel hi-cap mag can only be wound on with an Allen key - which is an irritant on the field so I didn’t use it and I feel the powder coating on the hand-guard could be improved. The SA-H08 retails for just £221.04 from Gunfire.com which is such a cheap price point for a full metal AEG replica. If you’re looking for a high-end aesthetic rifle at a budget price point, this Specna Arms model is definitely something you should consider!